In the name of the risen Christ, welcome to All Saints church, where the Christian message of love, hope and renewal has been proclaimed for more than 1000 years. This is one of the “Little Pilgrimage” churches where we hope you will find peace in its lovely setting and time for contemplation and prayer. Upend is a hamlet in this village. We are members of the 1662 Prayer Book Society and use the Book of Common Prayer (BCP). Compline is held weekly during Lent, the six weeks leading up to Easter. You will find more information here during Lent. Friends Day on September 22nd, 2pm. Speaker Dr. Jasmine Allen, curator of the stained glass museum, Ely who will be speaking on The radiant art of Stained glass. 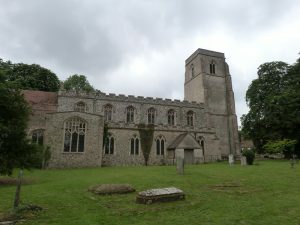 The church of All Saints is an ancient building of flint dressings, chiefly in the Norman style. The earliest surviving features are from the Norman period, although it is most probable that there was a church here in the Anglo Saxon period. 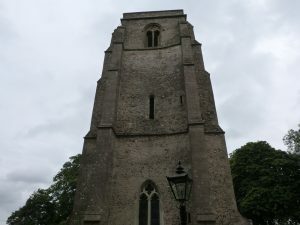 The Norman church had a cruciform plan with a central tower, in front of the present chancel arch, with north and south transepts, a chancel, half the length of the present one and a nave occupying roughly the same area as today. At that time there were neither side aisles nor a western tower. The south side of the Norman nave retains a round-headed lancet window of cl080 – 1100 and a magnificent doorway of c1170, by which you entered the church. This lavishly decorated doorway with pairs of flanking columns and three semi-circular mouldings shows ‘Christ in Glory’, seated on a rainbow in judgement with one hand on a book and the other raised in blessing. A more elaborate version of this is over the Prior’s door at Ely Cathedral. There are parallels with the two bearded head-supports at Great Bradley, where the de Tony family, lords of the manor here 1103 – 1309, were also lords. 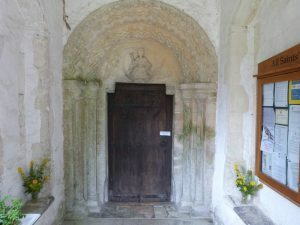 The 12th century ironwork has been reset on the wooden door. The ‘footprint’ of the central tower, very much like that at nearby Ousden, is marked by the line of the chancel arch and the two side arches, at the east end of the nave. The side transepts, or chapels, were to the north and south of these latter arches. The transepts were about two-thirds the width of the present north chapel and the position of the outer walls can be seen outside. The south transept was incorporated into the new south aisle in the 16th century. 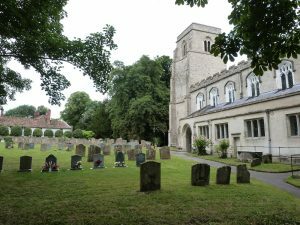 In conjunction with Lord and Lady Fairhaven who open their gardens for charity for three Sundays of the year we provide refreshments throughout these days in the church, at the same time the chairman of ‘The Friends of Kirtling Church’ provides valuable information on it’s history. In the summer we had an evening of music; we were entertained by the Fairhaven singers and the Colchester Military Wives Choir. At two yearly intervals we hold a craft day in the church, with a selection of beautiful items on display or being demonstrated. The church is open during the day, and entries in our visitor’s book show that we have visits from all over the world.